You know the feeling. I can handle the Green “Grammar” Squigglies in word and such but those red ones annoy me to no end. I want to take a second and congratulate two of my friends who just recently tied the knot on Saturday. Congratulations Greg and Lindsay, I hope life is awesome on you. The service was wicked beautiful and the food was delicious. But everybody knows it’s about the open bar. I was pretty hungover on Sunday to say obviously. So now that I’m officially unemployed for the time being (contract ended, see Friday’s strip) I’ve got some time to concentrate on things I’ve had on the back burner. So i’m super excited to start those up again. You know what I’m not excited about? I’m not excited to shop my demo reel around. Anybody know anybody who needs a 2d/3d animator or storyboardist? I’m pretty funny looking and I come with 8 gigs of hilarious (read: annoying) animated gifs to attach to every and any email I send out. Well, you can hit me up in the comments, or on twitter OR you can check out my deviantart where I post tastefully drawn men and woman. Also thanks to everyone who has been voting by using the TWC button on the side. Much appreciated! Haha, That last panel is pure gold! I also hate those red lines! And their bias against Canadian spelling, my name and my hometown! I dont know, i think id rather see them than the autocorrect on an i-phone. I HATE those damn squgglies!!! They always think i spell my runes wrong. Come on computer companies, whats wrong with writing runes? I can’t even write my initials in runic without it freaking out 52 ways from sunday! I mean really, whats wrong with runic, huh? I can’t stop laughing! Hahahahahaha! I hate those red squigglies too… They’re so darn annoying! Especially while I’m trying to write my stories! I get these squigglies a TON, because I have a tendency to use fictional character names and stuff. I’ve learned to ignore ’em. Alright. I normally read dozens of webcomics a day and normally I just lurk. The ones I really like — such as this one, by the way — I share with friends, but I don’t recall ever commenting. 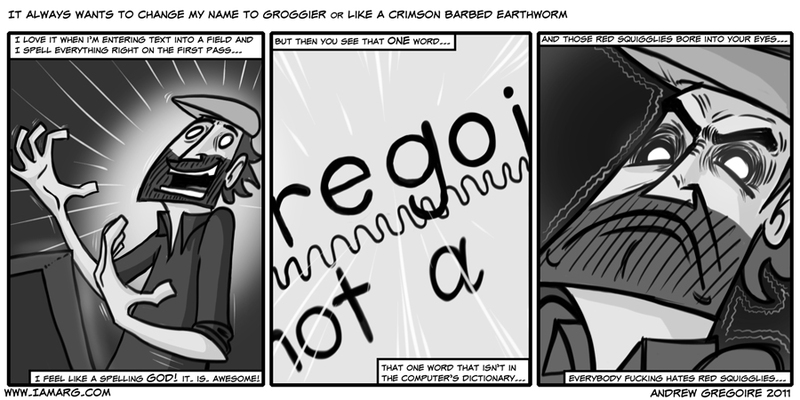 But I thought you’d chuckle to know that “rego” means “buttcrack” in Portuguese. I have yet to see these “spelling error” underlines. This comic is golden. Curse the red sqiggles. Its made worse by my ocd insisting on fixing it immediately. That’s something I love about tech today, you can add words to the computer’s dictionary! It’s not perfect and human vocabulary alters everyday, but at least I see the red wavy lines appear less and less.